More than 320 people died in New Hampshire from drug overdoses last year - almost twice the number of deaths than in 2010. In Manchester alone, 40 people have died since December. Tuesday evening on the streets of the Granite State's largest city, a man was found trying to get into cars and asking people for cash. "He did say he was using this morning, and he is just trying to get money for heroin," said Officer Tony Battistelli. Then, he stopped a driver for blowing a red light, and he saw track marks on his arm. Every traffic stop that night led to a candid conversation about heroin. Batistelli says the drug is so prevalent that officers now expect to find needles and have to question subjects to protect themselves. It wasn't long ago that 24-year-old Nathon Mack was the one being questioned by police. "I was willing to do absolutely anything," he said. He was arrested 12 times doing things just to maintain his heroin addiction. "Painkillers became too expensive and I started using heroin," he explained. Police say cheap heroin is what's fueling the epidemic. One oxycodone pill is $35 and will get you high just once - but pay two times that for one gram of heroin and you can get high up to seven times. "It's become so prevalent now that for every 10 operations that we conduct, nine of them involve some sort of opiate," said. Sgt. 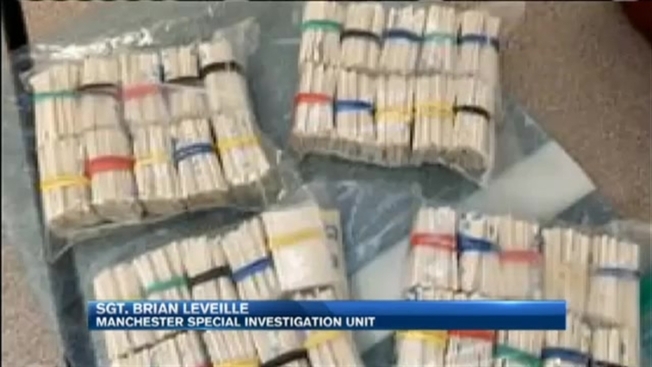 Brian LeVeille from the Manchester Special Investigation Unit. Manchester Police seized 1,380 grams of heroin in 2014, 30 times more than in 2010. "Parents are addicted to heroin and using in front of kids," said LeVeille. "Those are the tough cases." And if you think this is a problem just for the poor or uneducated, police say to think again. "It can happen to anybody," said Chief David Mara. "There's probably a good chance its happened to somebody in your family or a friend." Last March, Mack says he shot up in Manchester and blacked out for eight days. When he came to, he called for help. "I dont have time to wait. I have no idea where eight days of my life just went. I'm sick. I'm going to die," he recalled telling a detox facility. "They said, 'We'll call you back.'" He says it was two days before they called him back - two more days of using, two more days that could've been his last. "There needs to be a change, it needs to be soon, it needs to be drastic," said Mack. "My friends are dying." Manchester Police are bearing witness - 25 people have died in just the first four months of 2015. "We've got a problem on our hands and it needs to be addressed," said LeVeille. "People are just absolutely desperate," said Battistelli. "They'll do anything to get their drugs." Police in the city have seized about 1,100 grams of heroin already this year - they admit enforcement can only do so much. It's treatment that will save lives. Mack is 13 months sober and now working at Bonfire Recovery Services, helping others change their lives around.